We’ve been planning this wedding for at least a year. Wait, not I, my beautiful daughter and her now husband have been planning. I’ve just been along for the ride, giving my opinion when asked (and sometimes when not) and making that all important dress. What a joy it was to have our son with us and to welcome my niece and her husband for the weekend. Being so far away from family, we were delighted to have a house full of people the night before the wedding. We girls painted our nails, giggling and chatting in the kitchen while the guys watched TV in the lounge. Finally, the house was shrouded in darkness and while some snored and dreamt, the poor bride spent a sleepless night. Thank goodness for covering make-up and a smile that never faltered! The day dawned, grey and miserable as we had expected. The best we could hope for was a little sunshine to allow the ceremony to be outside. Lisa and I walked into the village just before 8am to have our hair done. By the time she returned just before 9, we had packed the car with our bags and clothes, the dress laid out on top in its special bag. 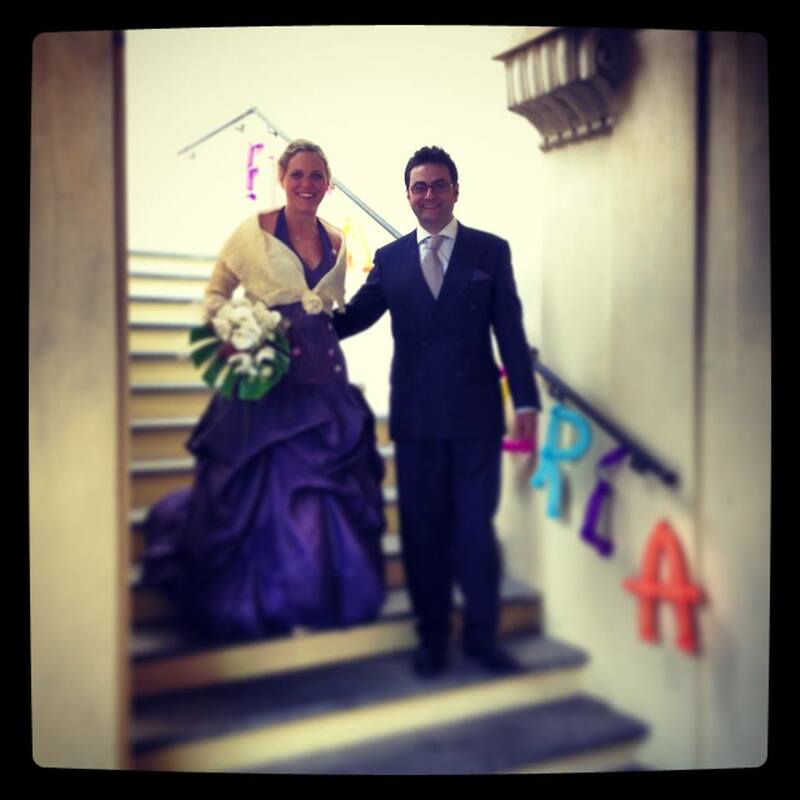 The venue, Castello di Viale, was an hour and a half away by car, so there was no time to waste. The wedding was to be at 11.30, but we still had to get dressed and do our make-up. How can I describe the tenderness a mother feels when helping her daughter to dress on her wedding day? She was so beautiful. And she radiated joy. First the petticoat with tulle ruffles, then the dress with its layers of tulle under the skirt and ruffles and bubble hem. Finally the silk jacket, and I had to tie the central rose three times to get it right. Perfect! She sat quietly while her best friend did her make-up. I watched and stored up the memories. My baby has turned into a lovely young woman. I love the flowers in her hair! The sun came out and the chairs were set out quickly in front of the municipal office. If we were lucky, we would make it. Perhaps I should explain. 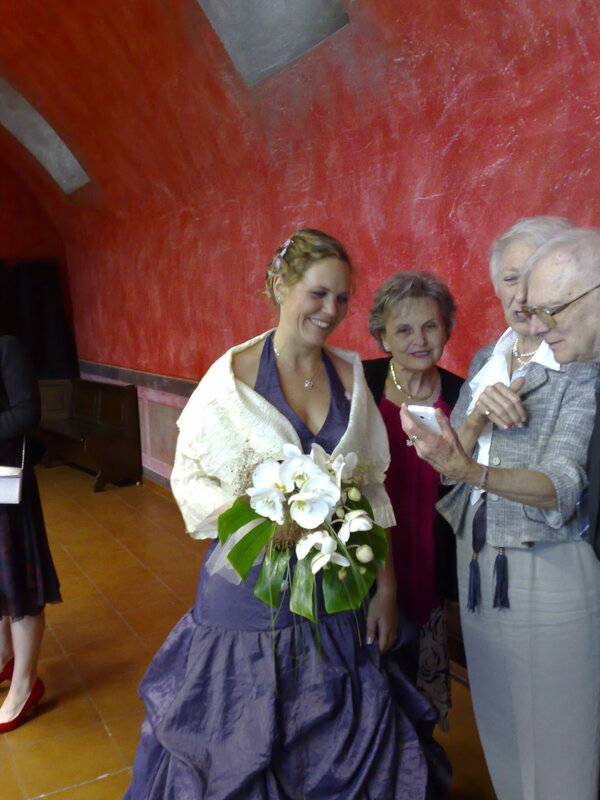 Lisa and Andrea chose a civil wedding which, in Italy, is performed by the mayor. How convenient that the municipal offices in this little village are right next door to the wedding venue (actually, in the same building)! In true Italian style, we started a little late. My heart skipped a beat as Lisa walked out of the building and down the aisle with her dad. She looked so calm and happy! Even her dad looked happy. Best of all – Andrea’s jaw dropped when he saw her. So with the ceremony over and the happy couple whisked away for photos, the guests mingled and enjoyed aperitivi until it was time to have lunch in the dining room upstairs. The chef outdid himself and, in accordance with the couple’s request, laid out a spread of both vegan and traditional aperitivi, each one more delicious than the last. Outside the dining room, they had a seating board with the tables named after countries. They agonised over the seating arrangements and it was obvious because every table was soon chatting and vibrant and everyone was having a great time. The wedding lunch was also a mix of traditional and vegan food, carrying on all afternoon and fuelled by good wine and a wonderful atmosphere. 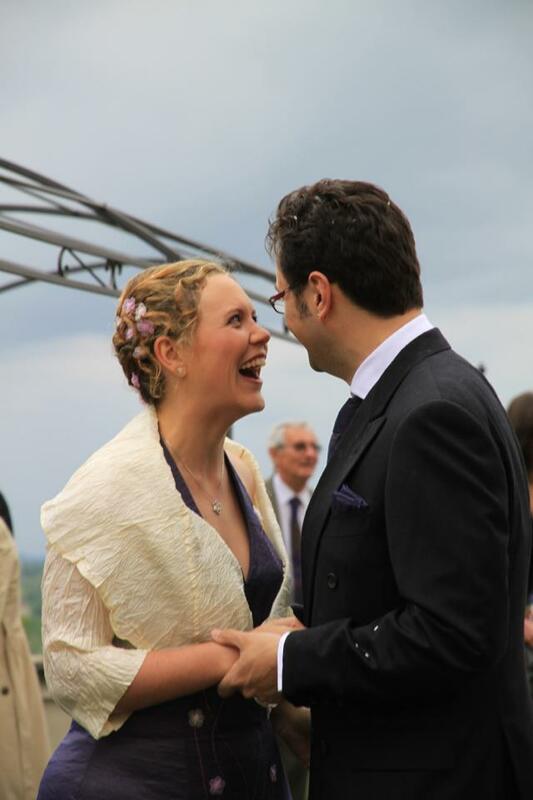 Unlike a traditional South African wedding, the couple decided to have no speeches and the happy atmosphere was carried along by their friends’ frequent cries of “Viva gli sposi!” and attempts to get the groom to drink as much as possible, along with much teasing and hilarity. Two events stand out in my mind. One was the “sawing of the log”. 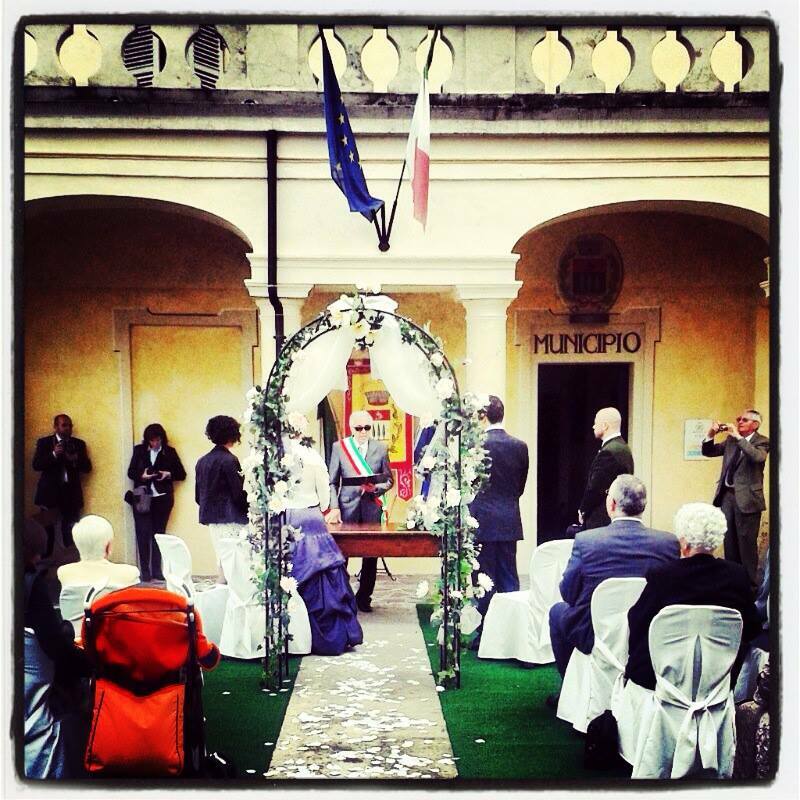 This is traditional at Italian weddings and signifies the first job the couple have to do together. A very dry log is brought in and set up on the table. 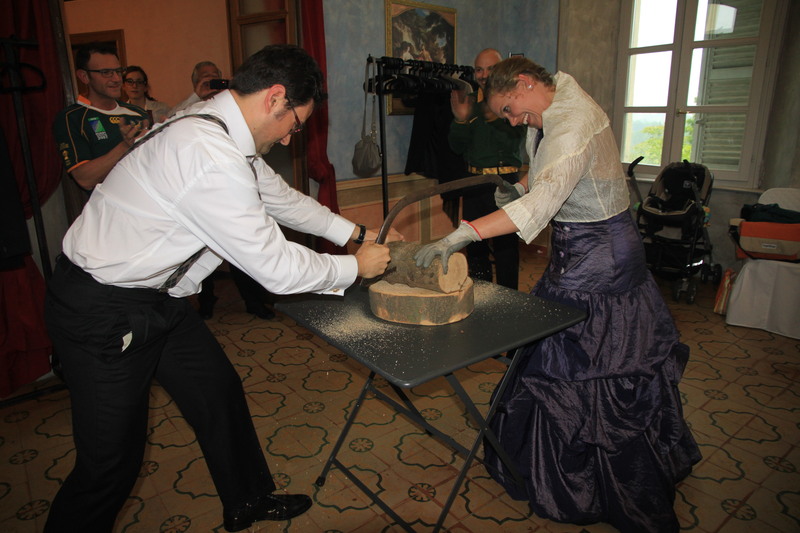 Then the couple are given a two-person saw and they have to cut the log while their friends shout comments and cheer when they finish. I had to smile when we complimented Lisa on how well they did and she said, “It was easy. I let Andrea do all the hard work. I just held on!” Here are some photos. The second tradition is one which Andrea didn’t want his friends to do for obvious reasons, but they did it anyway. The best man walks up and cuts the groom’s tie. He knew this might happen, so he changed his tie after the ceremony. I wish you could have seen Lisa’s face when they walked around to her side with the scissors in hand! I don’t know what she thought they were going to do! Well, they started with the bride’s parents, and cut the tie in little bits which they “sold” to the guests. The money went to the bride and groom. I guess I wasn’t thinking when I gave 50 euros. I hope I didn’t encourage anyone give more than they wanted to. It would be easy to take offence to a tradition like this, but I think it’s a sweet way to help a young couple who are just starting out. The rest of the day passed in a blur. Soon we were eating wedding cupcakes and being handed bonbonniere, gifts for the guests with sugared almonds attached. They had chosen bottles of a local wine which had a special label for their wedding. Wait for it – a skull and skeletons representing them with the quote “till death do us part” in both English and Italian. 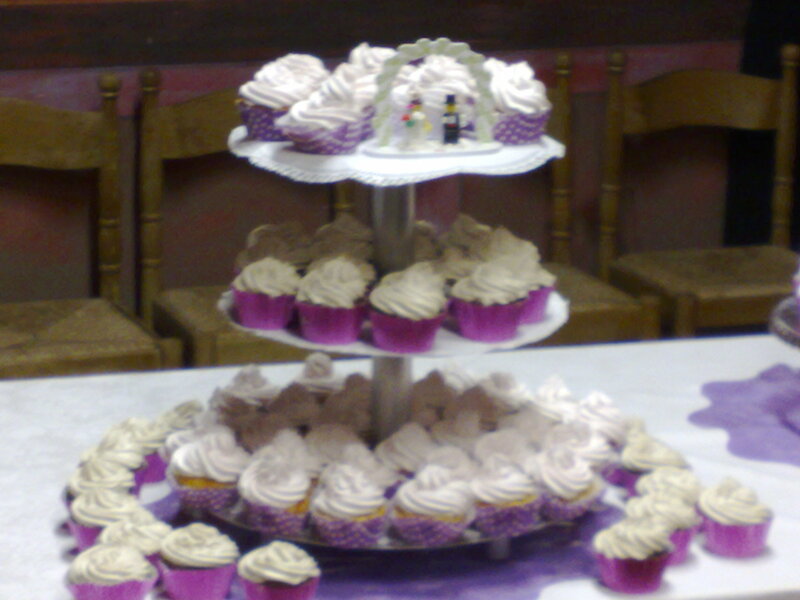 wedding cupcakes. Note the Lego bride and groom! Well, that was our very Lisa and Andrea wedding. Have you been to a wedding lately? What wedding traditions do you know of? I would like to thank my dear friend Ambelene of My Food Memories for the beautiful photos she took. They are precious memories. Oh, my goodness, what a gorgeous wedding! I was hoping you would post photos. The dress is stunning; that skirt is unbelievable. How did you do it? 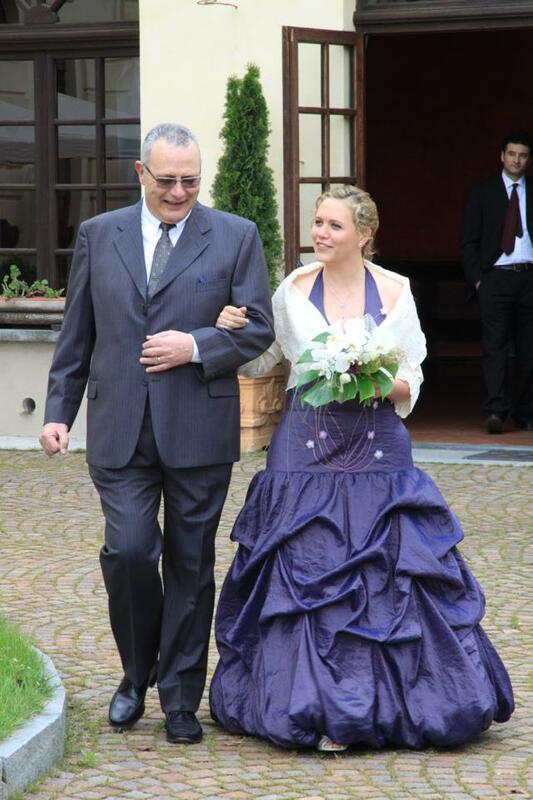 And how special that you could make your daughter’s dress. I’ve never heard of the sawing the log and cutting the tie traditions. What fun! And wedding cupcakes – fabulous idea. I wish them many, many years of happiness! Thank you Lynn. The skirt was actually easier than I thought once I finally figured out what to do. I attached an underskirt of gathered tulle to the join at the dropped waist. When I ruched up the folds, I attached the lower part to the tulle and let the upper part hang over so you can’t see the attachment stitches. The hem was pulled into a bubble hem with elastic and also attached to the tulle. Voilà! 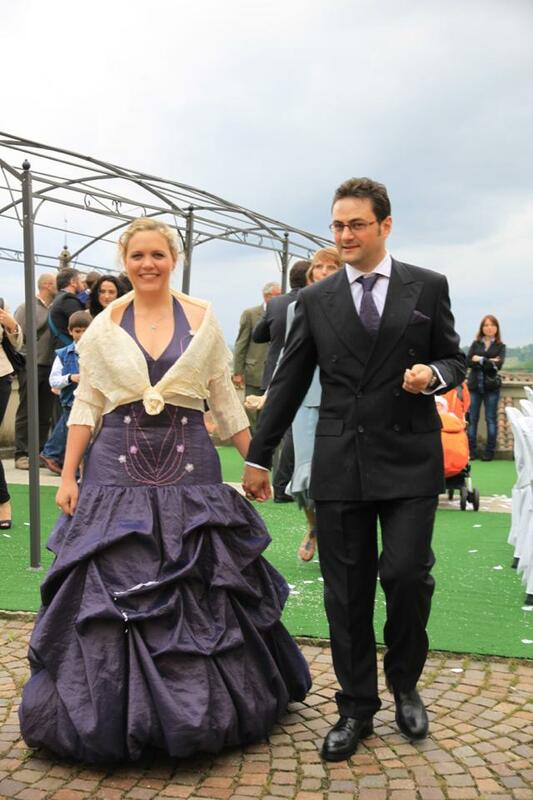 She also wore a petticoat with layers of tulle because she didn’t want to wear a hoop petticoat. This must be my most satisfying project yet as she said she felt totally comfortable and she looked gorgeous! You did a fabulous job and the fact that she felt so comfortable is wonderful! I’d still be sewing, trying to get it right! LOL. And how special for you both – that you could make your daughter’s dress. Hope you can take a rest now since you’ve been so busy the past few months. Your wonderful writing has transported me back to that awesome day, it will be tucked away in my heart forever. Thank you my friend. Your wonderful photos take me back too, and it was a wonderful day made all the more special for having you and Riaan with us.